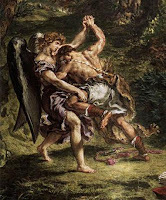 The account of Jacob's wrestling match with an angel on the banks of the Jabbok river used to perplex me greatly. Why did God set up this wrestling match? Why was it even remotely competitive, with the angel unable to overpower Jacob (before putting his hip out of joint)? Wasn't Jacob's refusal to let the angel go "until you bless me" impertinent? So why was he blessed anyway? Jacob's encounters with God just seem very different than other accounts of men who fell on their faces. It's been helpful for me to put Jacob's experience in context. First, Jacob was chosen by God while still in the womb to be the child of the promise--the fulfillment of God's promises to Abraham and Isaac. He would be Israel, and the human ancestor of Jesus. God was committed to Jacob. Of course, Jacob proved himself to be considerably less than worthy of such an honor--a superb example of God's great mercy and patience, but not much of an example of personal faithfulness. Moreover, Jacob was basically a wimp from early on--a mama's boy, in contrast to his manly brother Esau. He got what he wanted through deceit and conniving, and then by running away whenever things get dangerous. His weak and servile interaction with Rachel and Leah betrayed the pathetic depths to which he had fallen. He slept with whomever he was told, including the maidservants. At a particularly low moment he allowed Leah to buy his "services" from Rachel for a night with her son's mandrakes. To put it crudely, he played the prostitute while Rachel played the pimp. Jacob's early encounter's with God seemed to lead nowhere. He was impressed by the experiences, but his commitments were tentative and conditional: "If God will ... then the LORD will be my God". This is hardly to be confused with the "Here am I, send me!" of Isaiah. But then the wimpy weasel who was Jacob at this point could hardly be confused with the pillar of strength and devotion who was Isaiah. We can almost rationalize God's forgiveness of Isaiah's "unclean lips" on the basis of his comparative righteousness ... Jacob's filthy "lips" would seem to demand a harsher judgment. Obviously this reveals a misunderstanding of the "filthy rags" nature of man's righteousness. Isaiah was certainly not impressed by his own righteousness, but Jacob's failure to be impressed by God's majesty and mercy still seems troubling. Ultimately, however, God's long patience and preparation culminates at the Jabbok River. There's nothing like impending doom (the approach of his brother and enemy Esau with 400 men) to concentrate the mind. Jacob's prayers take on a new urgency and humility ("I am unworthy of all the kindness and faithfulness you have shown your servant.") but still his actions reveal his self-centeredness and cowardice, as he sends his servants ahead with bribes and then even his family ahead of him across the river, placing them between himself and the threat. God has planned this moment, however, and at the same time as He humbles Jacob, He also wants to build him up. God wants Jacob to submit, of course, but He also wants Jacob to be a man and to stop running and engage with Him. So Jacob is not presented with a test of cleverness, but a test of physical strength and endurance. The wrestling match with the angel goes on all night, and God allows Jacob some degree of success, though in the end the power of God is clear when Jacob's hip is wrenched. Still, Jacob learns tenacity, and refuses to let go unless he is blessed. Jacob needs to learn humility and submission, but he also needs to learn the courage and responsibility that comes with manhood. Jacob's response demonstrates that he was finally prepared to take the lesson to heart. He rises, limping and humbled, and then moves across the river and passes in front of his household to meet Esau himself. He bows down to Esau, accepting Esau's judgment as God's own, and receives mercy. It was, at long last, an act of faith, humility ... and the act of a man. Love the whole article accept the last six words! Jacob, by faith and humility, presented himself before Esau because - that Angel blessed him! Thus, Jacob knew from that point on it was "the act of God" not man that would prolong his days! Good writing and keep studying... wonderful! Thank you for sharing this. It helps to give me more insight on Jacob. I have often struggled with his story and his emotional slant on everything. 'I'd like to be six again', she replied, still looking in the mirror. On the morning of her birthday, he arose early, made her a nice big bowl of Lucky Charms, and then took her to Six Flags theme park. What a day! Five hours later they staggered out of the theme park. Her head was reeling and her stomach felt upside down. The moral of the story: Even when a man is listening, he is gonna get it wrong.?? ?GOD BLESS YOU AND YOUR'S.